An assortment of wild bees. Clockwise from top left: a male Bombus bumble bee; a Halictid sweat bee; an Andrena mining bee; and a Megachile leafcutter bee. Photo credits: Bioacoustic Unit/The Bee Team. 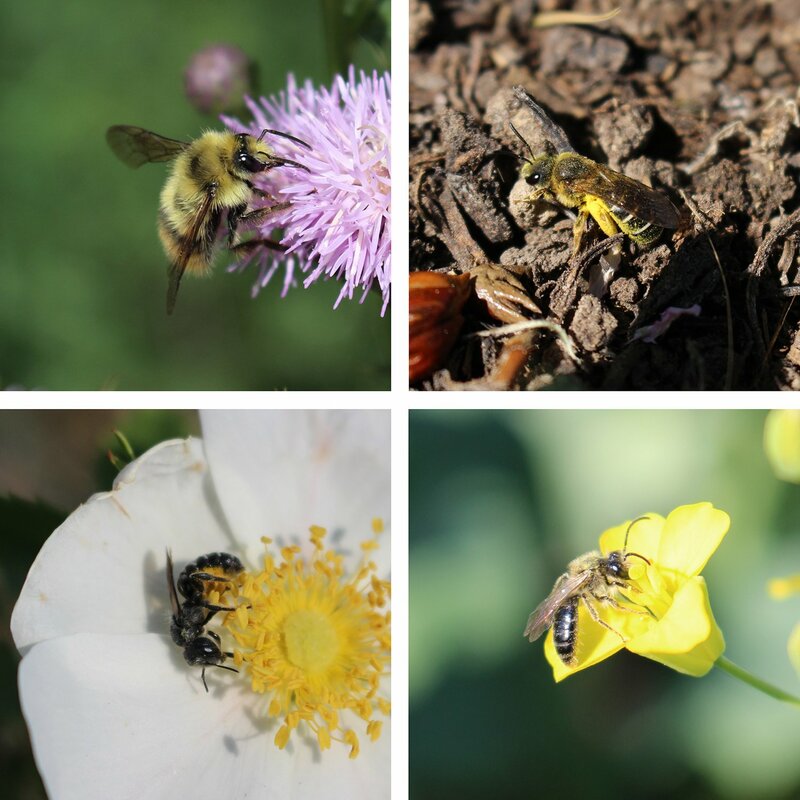 Guest blogger and ABMI collaborator Dr. Jessamyn Manson of the University of Alberta updates us on recent research into the relationship between wild bees and canola. At the peak of summer, your garden is probably buzzing with life! Alberta is home to nearly 300 documented species of wild bees, from large, charismatic bumble bees to nearly invisible masked bees. These insects nest in a variety of habitats, eat diverse diets, and have wildly different social structures. All of this variety means that different bees do better under different conditions. In Alberta, a province whose landscape includes mountains, prairies, wetlands, and boreal forest, this translates into huge variation in bee communities across the province. Over the past two years, the ABMI has been working with researchers at the University of Alberta to understand this variation and tackle some pretty big questions. For example, what does agricultural development mean for bees, and what do bees mean to economically important crops such as canola? Pollination by bees…seems to produce both more and bigger canola seeds. The “Bee Team”, led by Dr. Jessamyn Manson at the University of Alberta and her collaborator Dr. Cameron Carlyle, investigates bee communities in agricultural areas around Alberta. To date, the team has visited 68 agricultural sites from Grand Prairie to the Montana border and collected nearly 20,000 bees. The Team’s focus has been on two types of agriculture: canola fields and grasslands grazed by cattle—both key parts of Alberta’s economy, and both populated with plants that are pollinated by bees. The ABMI reported preliminary results back in February 2015, but looking at more data has revealed some striking clues about which bees are found where—and why! The margins of a canola field. Canola flowers create a ‘pulse’ of food for bees, but are short lived. The rest of the time, bees must scrounge for nectar from flowers elsewhere, such as along roadsides. Photo credit: Bioacoustic Unit/The Bee Team. Bees require two key resources: food and nesting sites. In highly managed areas like cropped fields, one or both of these resources may be limited. Canola fields provide a massive, short-term pulse of nectar and pollen while they’re in bloom, but bees may struggle to find weeds and native flowers in field margins during the rest of the season. Removing native vegetation and tilling crop fields each year can also make it difficult for bees to establish a home. So natural habitat in and around canola fields is vital for bees: the study indicates that both the total number of bees and the number of different bee species in canola sites are related to the amount of natural habitat in the surrounding areas. 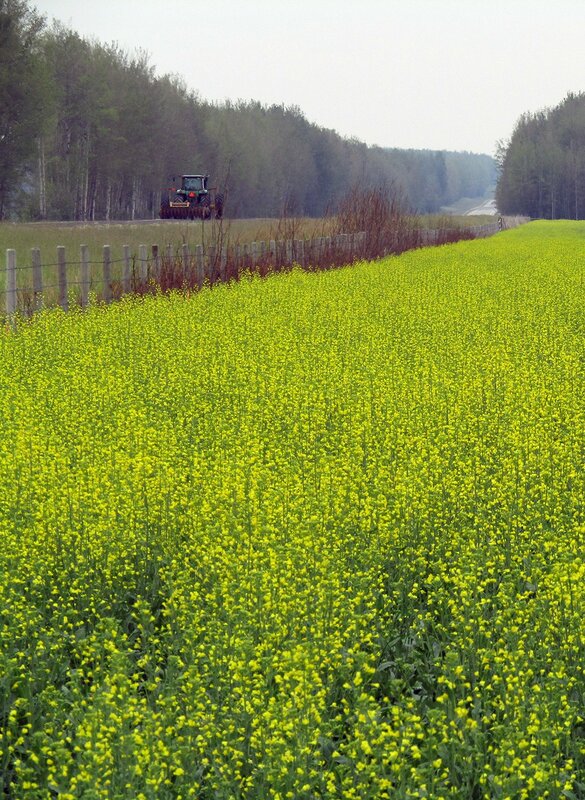 Though the effect varies by region, canola fields have more bees, and more kinds of bees, when there are forests, grasslands, or other natural habitats nearby. The question that follows is, what does having more bees mean for the canola? 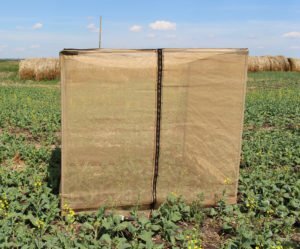 Although canola can self-pollinate, studies have shown that insect pollination, a service primarily performed by bees, results in a yield increase. In fact, many canola growers keep honeybee hives in their fields to increase yield. However, these same studies show substantial variation in the impact of bee pollination on canola yield and most focus on honeybees. Do wild bees also contribute to canola yield? Once again, the Bee Team is finding answers. Maintaining un-cropped land near canola fields can help maintain healthy populations of wild bees—and potentially improve crop yield—by providing nectar sources when canola flowers are not available. 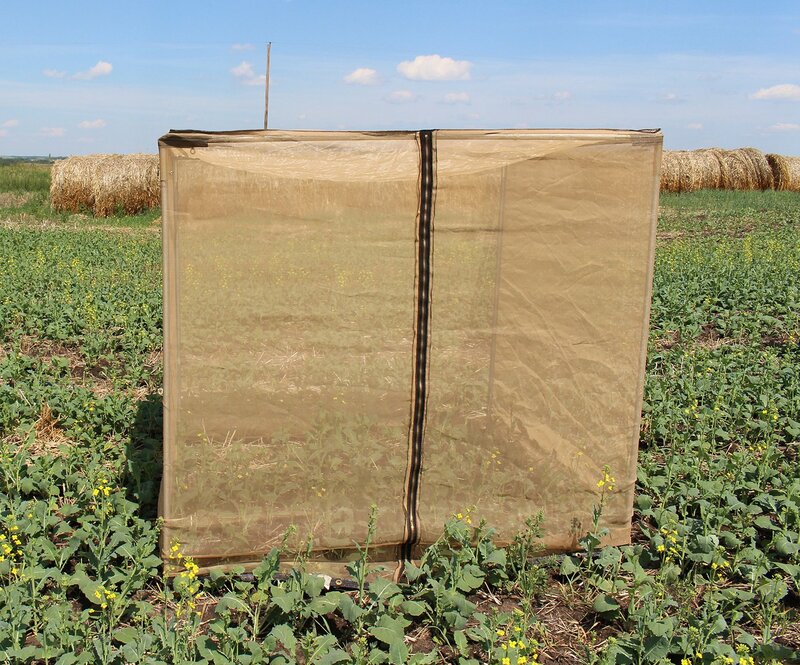 To determine how pollination by wild bees can affect canola yield, Dr. Manson and her team conducted a pilot study at four canola fields near Kinsella, Alberta. Early in the growing season, the team erected several large cages that let the wind in but kept bees out. This let them estimate seed yield from wind pollination alone (i.e., seeds from plants inside the cages), and compare it to seed yield from both wind and bee pollination (i.e., seeds from plants outside the cages that were exposed to pollinators). Sure enough, plants exposed to bees had 20% higher average total seed yield. Plus, the average weight of these seeds was 15% higher than those that were only wind pollinated. So pollination by bees, and particularly wild bees, seems to produce both more and bigger canola seeds. Together, these studies suggest that land management practices that support wild bees can also improve the yield of some crops. An exclosure designed to keep bees out while letting wind through. This lets the Bee Team determine how bee pollination impacts canola yield. This work highlights some of the ways in which the worlds of bees and humans intersect—and just how many questions remain unanswered. Going forward, Dr. Manson and Monica Kohler, part of the original Bee Team, are joining forces with Dr. Paul Galpern at the University of Calgary to investigate how variation in habitat surrounding canola fields, such as grasslands, forests and wetlands, affects the diversity and abundance of wild bees. They’ll also work directly with growers, using precision yield data collected during harvest to look at relationships among wild bees, landscape features, regional variation, and canola yield. 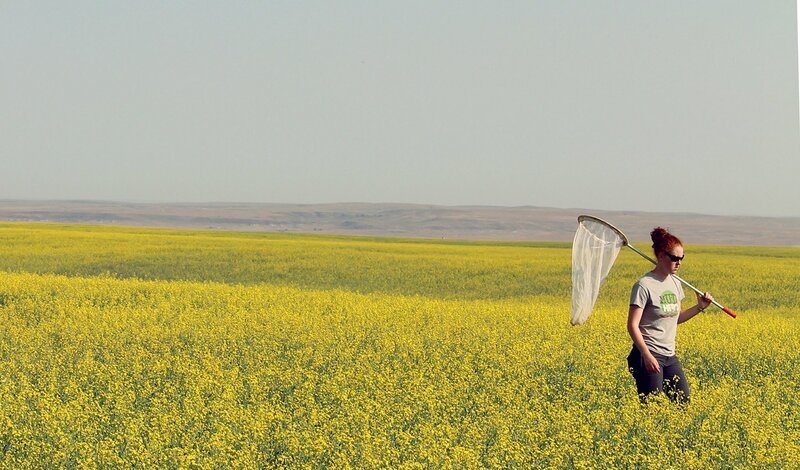 The story is only just beginning to be told: over the next four years, the researchers hope to make significant progress in understanding the services that wild bees can provide, and how canola contributes to supporting wild bee communities across Alberta. This research was supported by the Alberta Livestock and Meat Agency (ALMA) and the ABMI’s Ecosystem Services Project, funded by Alberta Innovates – Bio Solutions. Continuing research will be additionally supported by the ABMI and the Canola Agronomic Research Program, funded by the Canola Council of Canada.